This bathroom vanity cabinet laboratory is Amish handcrafted in your choice of Oak Wood, Brown Maple Wood, Rustic Cherry Wood, Quarter Sawn White Oak Wood or Cherry Wood. It is shown in quarter sawn white oak wood with a Michael's Cherry finish which is our most popular wood and finish for Mission furniture. This bathroom vanity is sure to bring a new look into your guest bathroom. It will look perfect in a craftsman style home. Your bathroom space will feel classic and fashionable. 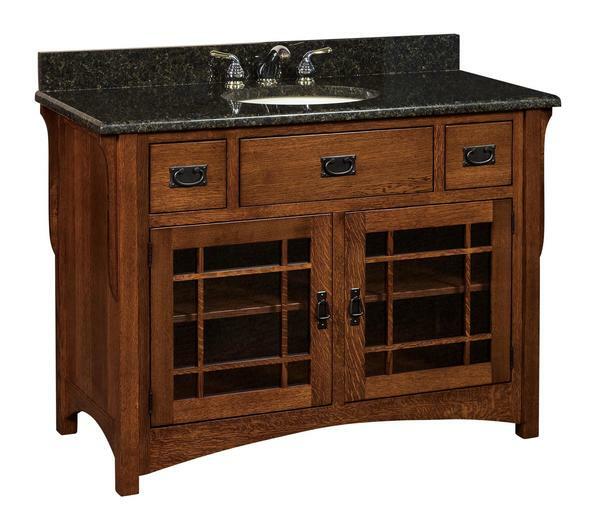 This stunning bathroom vanity is handcrafted to order and made in America. Please call to speak to a Amish furniture specialist with questions, customizations or to receive finish samples at 1-866-272-6773. You can also email then at questions@dutchcrafters.com or visit our store in Sarasota, Florida.